Cloud Computing as a paradigm, is fundamentally altering the art and science of doing business online and represent a profound transformation in IT infrastructure. It enables the organizations to operate efficiently and provides scalability, responsiveness and drive growth and revenue. We at InstaCarma, work with our clients to assess the suitability for the cloud, help them choose the precise platforms and assist them put their best foot forward. Enabling our customers to analyze cloud readiness quotient and adopt cloud technologies through well-defined maturity models are our key strengths. We have a proven track record of successful IT implementations. We are now helping Qatar in Effective Utilization of Computing Resources, analyzing ROI on cloud adoption, reducing Data center Space Utilization, Centralized Management & Upgrades and Faster Deployments of solutions into Cloud etc. 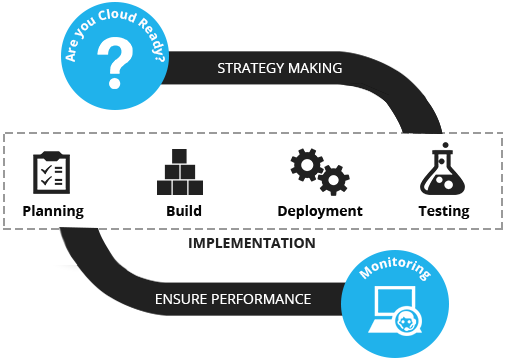 We give you the much needed confidence by setting up a road map for managing successful cloud migration, development, integration and administration services through our cloud consulting services. Understand if you’re Cloud ready in primary stages. Improved operations & time for innovation. Achieve seamless customization and automation of Cloud solutions. Rapid deployment provider for all cloud services. Reduced possibilities of complications and imbalances – we avoid dealing with several providers, technologies, apps, user provisioning, security, identity, etc. Step-by-step implementation turns out to be much easier and swift – we understand your business better. Our Agile Implementation framework is designed to solve your business problems in a step-by-step manner and leverage service Cloud Implementation’s best practices. Following this model helps us produce concrete results while eliminating project risks. Private, virtual private and hybrid cloud infrastructure implementation: Citrix Xen, VMWare, OpenStack, CloudStack, Amazon EC2 and Rackspace. 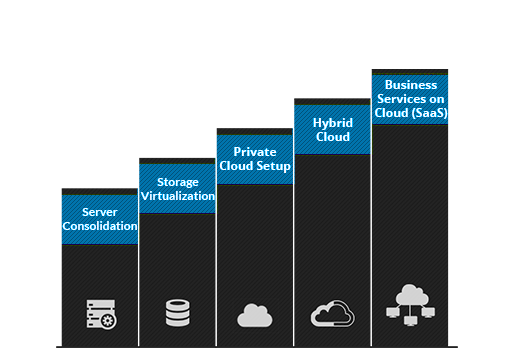 Migration of applications from dedicated and virtualization platforms to a cloud platform. Migration of virtualization platforms to cloud platforms.